The historical range of the Poweshiek Skipperling (Oarisma poweshiek) is almost entirely confined to the northern part of the tallgrass prairie from southeastern Manitoba through Minnesota and the eastern Dakotas, south to Iowa, and east to Illinois and northeast Indiana. Disjunct populations occur in southern Michigan in prairie-like wetlands (Layberry et al. 1998; Opler et al. 2006). Prior to settlement, the Poweshiek Skipperling was probably one of the most abundant butterflies of Minnesota’s prairie region (Prairie Parkland and Tallgrass Aspen Parklands provinces), but its prairie habitat has been reduced to small isolated remnants that collectively comprise only a tiny fraction of its formerly vast expanse (Minnesota’s Remaining Native Prairie). It has suffered similar habitat loss throughout its prairie range. The only documented records of its occurrence in Illinois and Indiana are from the late 20th Century (Bouseman et al. 2006; Selby 2005), and Wisconsin records are from a handful of sites in the southeast quarter of the state (Selby 2005). As of a recent status assessment of this species, done for the U.S. Fish and Wildlife Service (Selby 2005), it still occurred in a number of sites in northern Iowa and northeast South Dakota, a few sites in southeast North Dakota, and three sites in southeast Wisconsin. Western Minnesota supported the majority of known, extant occurrences at that time. Colonies of the skipperling were still present in about 70 per cent of the 16 sites where it had been recorded in Michigan. Although it was not rare in Minnesota, it was considered vulnerable because of the continuing loss of native prairie, the small size of most populations, and their isolation from each other. Accordingly, it was listed as a species of special concern in 1984, and its listing was not changed in the 1996 review of the list. However, it has become apparent that the Poweshiek Skipperling has suffered a precipitous decline throughout its prairie range beginning around 2000-2001, and it may now have been extirpated from Iowa, Minnesota, and the Dakotas. It has also disappeared from many of the Michigan sites. The last confirmed sightings of this butterfly in Minnesota were in 2007, despite extensive annual surveys beginning in 2013. The only known remaining population in the western part of its range, where more than 95 per cent of the species’ global population occurred, is in Manitoba, Canada, a few kilometers north of the Minnesota border. These facts prompted the Minnesota Department of Natural Resources (MN DNR) to revise its state status in 2013 from special concern to endangered. Because the skipperling also appears to be declining in Wisconsin and Michigan, the U.S. Fish and Wildlife Service listed it as federally endangered in 2014. Concluding that the Poweshiek Skipperling has been extirpated from the state is premature, though searches since 2013 of a large fraction of the many sites in Minnesota where the species used to occur have failed to find it. The Poweshiek Skipperling is a small butterfly, more delicate looking than most “grass” skippers (subfamily Hesperiinae) in Minnesota. The forewing length (base to apex) is 1.4-1.6 cm (0.55-0.63 in.) in both sexes. Antennae are short and relatively stout and have blunt-tipped clubs. Although capable of rapid flight, this skipper more typically flies erratically just above the grasses at a speed that is relatively easy to follow with the eye. Its flight rarely exhibits the “skipping” quality that gives the family its name. Males and females are very similar in appearance, apart from the thicker, heavier abdomen females have for a few days after eclosing. The upper surface of the wings is a uniform dark brown, with a purplish gloss in fresh individuals, except for a splash of glossy orange along the leading edge of each forewing. Males do not have a brand on the forewing as most grass skippers do. The under surface of the hind wings is distinctive, having a pale, finely pinstriped look created by white veins on a hoary gray-brown ground color. There are a couple of surface features that differ between the sexes, but these are difficult to assess in the field. The forewing fringe of females is slightly paler on the upper side than that of males. Most reliably diagnostic, the antennae of females have alternating pale and brown annulations along their upper side, while in males this surface is a smooth, even golden color, but magnification is required for determination. The closely related Garita Skipperling (Oarisma garita) is the species most similar to the Poweshiek in Minnesota. It is restricted to the northwest corner of the state and is extremely rare even there. The Garita Skipperling is slightly smaller than Poweshiek, a lighter golden-brown above, and lacks the latter’s strongly contrasting white veins on the hind wings beneath. 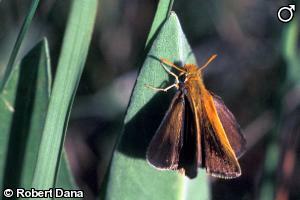 The introduced European Skipper (Thymelicus lineola) is about the same size as the Poweshiek Skipperling, but its wings are bright golden-orange above, with narrow dark margins. Males have a small, very thin black stigma in the central part of the forewing. Beneath, the hind wing veins are not conspicuously lighter than the ground color as they are in the Poweshiek. It has become common in eastern Minnesota but is less often encountered in the western part of the state, though this can be expected to change. Habitats utilized by the Poweshiek Skipperling in Minnesota include wet to dry native prairie but not sand prairie. The same is reported for the Dakotas, though moist prairie seems to be favored there (Royer and Marrone 1992). A reported preference for wet prairie in Wisconsin has been interpreted as an artifact of greater fire-mortality in upland prairie habitat (Borkin 1995). The habitat in Michigan is a type of open wetland known as prairie fen (Pogue et al 2016). These are plant communities on peaty soils saturated by upwelling calcareous groundwater; wetland-obligate sedges dominate, but several grasses characteristic of prairie communities are present as well (Cohen et al. 2014). Interestingly, the Poweshiek Skipperling has never been reported from sedge-dominated wet meadow or fen in Minnesota. Habitats dominated by nonnative grasses such as Kentucky bluegrass (Poa pratensis), smooth brome (Bromus inermis), and redtop (Agrostis gigantea) do not appear to be suitable for this skipper. The Poweshiek Skipperling has a single annual generation. Adults have been recorded from the last week of June into the first week of August in Minnesota, but in a typical year most adults fly between the end of June and the middle of July. Eggs hatch in about ten days, and the partly grown larvae overwinter and complete development the following spring. The grass skippers are so called because their larval food plants are restricted to grasses or sedges. A spike-rush (Eleocharis elliptica) has frequently been cited as the larval food plant of the Poweshiek Skipperling, based on an early report of egg-laying on this member of the sedge family (Cyperaceae) in Michigan (Holzman 1972). However, observations in Minnesota and Wisconsin (Borkin 1995, 1996) indicate that prairie grasses, especially prairie dropseed (Sporobolus heterolepis) and little bluestem (Schizachyrium scoparium var. scoparium), are probably the most important larval hosts. Apparently, females do not restrict egg-laying to suitable host plants but leave it to larvae to find them. Unlike most skippers, Poweshiek larvae do not construct shelters but rest head down on grass blades or stems when not feeding. Larvae overwinter in a similar position on stems (Borkin 1995). Males seek mating opportunities through meandering search flights above and among the tops of grasses. This mate-seeking behavior is known as “patrolling” and is different from the perch-chase behavior of many grass skippers (Scott 1986). Females probably mate soon after they become capable of flight, but whether they mate with more than one male is unknown. Research in Canada has found that adults may live up to 10-12 days in the wild, but the average is probably about a week (Richard Westwood, personal communication 2017). Nothing is known about the dispersal behavior of mated females. Habitat loss that has reduced the Poweshiek Skipperling’s foothold in Minnesota to scattered, mostly small refuges of native prairie (Minnesota's Remaining Native Prairie) is the fundamental threat to this butterfly’s survival in the state. Small colonies are vulnerable to extinction as a result of natural events (such as severe drought and hailstorms) or human-caused events (such as insecticide application) as well as from the vagaries of normal population processes (for example by chance all adults in one generation are males). Dispersal behavior has not been investigated, but field observation suggests that non-prairie habitats are a strong barrier to movement. Therefore, immigration is unlikely to help sustain small colonies or to reestablish colonies in suitable habitat after extinction events. Loss of genetic diversity is another possible threat. Even where protected, prairie in Minnesota is strongly susceptible to woodland encroachment. Prescribed burning, to replicate the pre-settlement fire regime that created and maintained the tallgrass prairie, is the usual management tool for preventing succession. However, both fall and spring burns can result in high skipperling mortality because of the exposed position of larvae and pupae. In wet prairie habitat, damp litter and soil may afford some protective buffering (Borkin 1995). Accordingly, the use of prescribed fire as a habitat management tool must be conservative. A site needs to be subdivided and the units burned in a rotation that leaves enough larval habitat unburned each time to assure population survival, with enough time between burns for the skipperling to recolonize burned areas. This can be difficult for small sites; haying may provide a suitable option in these cases. Swengel (1998) provides evidence that late-summer haying is more favorable than rotational burning for several prairie skippers. Mowing should not occur until larvae are at least second instars, which is in early August. First instars may not be able to cope with the disturbance of mowing and raking. Beginning in the late 1980s, the Minnesota DNR sponsored or supported a number of survey efforts to locate new populations of Poweshiek Skipperlings and update information for previously known populations. Since 2013, it has been conducting extensive annual surveys to detect extant colonies in the state. Many of the prairie remnants that supported colonies of the Poweshiek Skipperling in Minnesota are partly or completely protected as preserves by The Nature Conservancy; as Scientific and Natural Areas, State Parks, or Wildlife Management Areas by the Minnesota DNR; or as Waterfowl Production Areas or National Wildlife Refuges by the U.S. Fish and Wildlife Service. Detailed information about occurrences is available to managers of these lands. The Minnesota DNR has endeavored to inform managers regarding the potential negative impacts of prescribed burning on the arthropod fauna of prairies. Awareness of the threats and willingness to follow guidelines to ameliorate them have increased, but there is still a need for improvement. Information about documented Poweshiek occurrences is taken into account as part of the state environmental review process for various development projects to help avoid potential negative impacts. That said, the failure to detect Poweshiek in sites where it used to occur has weakened the force of historic records. The Minnesota Zoo has embarked on a project to breed Poweshiek Skipperlings in captivity to augment extant but declining populations and to eventually reintroduce the species to sites where it has disappeared. The federal listing will strengthen protection of any still-extant colonies that may be discovered and of reintroductions. Borkin, S. S. 1995. 1994 Ecological studies of the Poweshiek Skipper (Oarisma poweshiek) in Wisconsin. Report to Bureau of Endangered Resources, Wisconsin Department of Natural Resources, Madison, Wisconsin. 13 pp. + ii. Borkin, S. S. 1996. Ecological studies of the Poweshiek Skipper (Oarisma poweshiek) in Wisconsin-1995 season summary. Report to Bureau of Endangered Resources, Wisconsin Department of Natural Resources, Madison, Wisconsin. 5 pp. + Appendix and Table. Bouseman, J. K., J. G. Sternburg, and J. R. Wiker. 2006. Field guide to the skipper butterflies of Illinois. Illinois Natural History Survey Manual 11. Champaign. viii = 200 pp. Dana, R. P. 1991. Conservation management of the prairie skippers Hesperia dacotae and Hesperia ottoe: basic biology and threat of mortality during prescribed burning in spring. Station Bulletin 594-1991. Minnesota Agricultural Experimant Station, University of Minnesota, St. Paul, Minnesota. 63 pp. Ferris, C. D., editor. 1989. Supplement to: a catalogue/checklist of the butterflies of America north of Mexico. The Lepidopterists' Society Memoir No. 3. 103 pp. Holzman, R. W. 1972. Eastern range extension for Oarisma powesheik Parker (Lepidoptera: Hesperiidae). Great Lakes Entomologist 5(4):111-114. Layberry, R. A., P. W. Hall, and J. D. LaFontaine. 1998. The butterflies of Canada. University of Toronto Press, Toronto, Ontario. 280 pp. + color plates. Marrone, G. M. 2002. Field guide to butterflies of South Dakota. South Dakota Department of Game, Fish, and Parks, Pierre, South Dakota. 478 pp. Nielsen, M. C. 1999. Michigan butterflies and skippers: a field guide and reference. Michigan State University Extension, East Lansing, Michigan. 248 pp. Opler, P. A., H. Pavulaan, R. E. Stanford, and M. Pogue, coordinators. 2006. Butterflies and Moths of North America: Poweshiek Skipperling (Oarisma powesheik) [web application]. NBII Mountain Prairie Information Node, Bozeman, Montana. <http://www.butterfliesandmoths.org/>. Accessed 26 July 2006. Opler, P. A., K. Lotts, and T. Naberhaus, coordinators. 2009. Butterflies and Moths of North America [web application]. Big Sky Institute, Bozeman, Montana. <http://www.butterfliesandmoths.org/>. Accessed 17 June 2009. Royer, R. A., and G. M. Marrone. 1992. Conservation status of the Powesheik Skipper (Oarisma powesheik) in North and South Dakota. Report to the United States Department of the Interior, Fish and Wildlife Service, Denver, Colorado. 31 pp. + ii, plates, appendix. Scott, J. A. 1986. The butterflies of North America: a natural history and field guide. Stanford University Press, Stanford, California. 583 pp. Selby, G. 2005. Status assessment and conservation guidelines Poweshiek Skipperling (Oarisma poweshiek) (Parker) (Lepidoptera: Hesperiidae): Illinois, Indiana, Iowa, Michigan, Minnesota, North Dakota, South Dakota, Wisconsin. Twin Cities Field Office, U.S. Fish and Wildlife Service, Bloomington, Minnesota. 57 pp. Selby, G. 2009. 2007/2008 Prairie butterfly surveys in western Minnesota. Natural Heritage and Nongame Research Program, Minnesota Department of Natural Resources. 28 pp. + appendices. Swengel, A. B. 1998. Effects of management on butterfly abundance in tallgrass prairie and pine barrens. Biological Conservation 83(1):77-89.